Please enjoy this Dwight Eisenhower poem, I Like Ike, by Denise Rodgers. * "I Like Ike" was the slogan on the 1952 Eisenhower campaign buttons, because "Ike" was Eisenhower's nickname. The slogan was a good one, as the people did, in fact, "like Ike" during his two terms in office. The nation was in a post-World War Two economic boom. Now seen as the dawn of the Baby Boom era, Eisenhower's two terms included the end of the Korean War, growth of the Civil Rights movement, as well as the infamous McCarthy anti-Communist Senate hearings. * With prosperity, more and more homes featured modern rotary-dial phones and the very new-to-the-world TV sets. Elvis Presley was making his female fans swoon -- both with his singing and his famed swivel hips. Beatniks were the pre-hippie counter-culture young people who were known to snap their appreciation (as opposed to applause) when listening to a poet or musician. * Dwight David Eisenhower was born in Denison, Texas on October 14, 1890, and grew up in Abilene, Kansas. He was the third of seven sons in a poor family, and he excelled in sports. Much to his pacifist Mennonite mother's dismay, he won an appointment to West point military academy in New York, and graduated in 1915. * While stationed in San Antonio, Texas, also in 1915, as a second lieutenant, Eisenhower met Mamie Geneva Doud. They were married in 1916 and had two sons, one of whom died in infancy. * Eisenhower served as a military aid to General John Pershing, who had been commander of the US forces in World War I. While serving in the same capacity under General Douglas MacArthur, the US Army Chief of staff, Eisenhower was stationed in the Philippines, from 1935 - 1939. When the Nazis invaded Poland in 1939, effectively starting World War II, Eisenhower returned from the Philippines. * In November 1942, Eisenhower headed Operation Torch, a successful Allied forces invasion of North Africa. He then directed an amphibious invasion of Sicily and the Italian mainland in 1943. * Eisenhower became a full general in early 1943, and was appointed supreme commander of the Allied Expeditionary Force, and led the Allied invasion of Nazi-occupied Europe. * When Paris was liberated on August 25, 1944, this turned the tide of the war to the Allies. Eisenhower returned home to a hero's welcome to serve as chief of staff of the US Army. * In 1948, Eisenhower left active duty to become president of Columbia University in New York City. * In 1950, President Harry Truman asked Eisenhower to take command of the newly formed North Atlantic Treaty Organization (NATO) in Europe. * In 1952, Eisenhower was urged by Republican leaders to run for president. 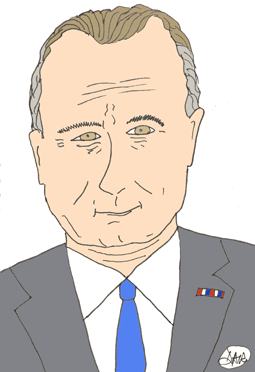 He resigned his commission and left his NATO base in Paris in June of that year. At the July Republican Convention, he was nominated on the first ballot. He ran with Richard Nixon as his running mate, and won! *Dwight David Eisenhower was a moderate Republican. He continued most of Franklin Roosevelt's New Deal, and Harry Truman's Fair Deal programs. He strengthened Social Security, increased the minimum wage, and created the Department of Health, Education, and Welfare. * On June 29, 1956, Eisenhower created the Interstate Highway System, which included 41,000 miles of road across the country. This was the single largest public works program in the US, and took ten years to complete. * Republican Senator Joseph McCarthy led anti-Communist hearings in 1954. While Eisenhower did not approve of these hearings, in order to maintain party unity he worked behind the scenes to work against him. * Eisenhower signed Civil Right legislation in 1957 and 1960, providing federal protection for black voters. He sent troops to Little Rock, Arkansas, to assure compliance with the federal court order to desegregate schools. He wrote, "There will be no second class citizens in this country." * Eisenhower signed an Armistice to end the Korean War, basically a truce to end hostilities. Other than sending combat troops to Lebanon in 1958, there were no other military actions during his two terms. Instead, he authorized the CIA (Central Intelligence Agency) to undertake covert operations against communism worldwide. * Eisenhower tried to improve Cold War relations with the Soviet Union. Russia and the United States had both developed hydrogen bombs. With this threat in mind, Eisenhower met with British, French and Russian leaders in Geneva in 1955. While the Russians would not agree to a plan that made each country's nuclear arms more visible to each other, they were cordial in Geneva, which did ease international tensions. * Eisenhower also worked to strengthen NATO, and also created the Southeast Asia Treaty Organization, to combat communism in that part of the world. * In 1955, Eisenhower had a heart attack while visiting Denver. He was in the hospital for seven weeks. Less than one year later, he was elected for a second term. * During both terms in office Eisenhower enjoyed high public approval ratings, despite criticism he endured from both the right and the left. * Before leaving office, Eisenhower warned of the "military-industrial complex," a partnership of national defense with big business. He felt it would influence the course of American history, if unchecked. * After leaving office, Eisenhower returned to his farm in Gettysburg, Pennsylvania, with his wife, Mamie. There he worked on his memoirs and published several books. * Dwight David Eisenhower died March 28, 1969, after a long battle with congestive heart failure. Mamie Eisenhower died ten years later, in 1979. They are buried at the Eisenhower Presidential Library and Museum in Abilene, Kansas. If you enjoyed this Dwight Eisenhower poem, please go to our US Presidents List page for links to poems about every US president. For more Dwight Eisenhower facts, go to Whitehouse.gov or History.com.